A loose woman rediscovers a former lover during a dangerous train ride to Shanghai. An automotive engineer bound for a holiday in Spain meets a sultry jewel thief. A blue-collar worker on New York's depressed waterfront finds his life changed after he saves a woman attempting suicide. The Reigning Beauty of the Screen! Sophia's Aunt: Grand duchess of Russia. Not bad for this family. Princess Sophia Frederica: I wonder what he looks like. Princess Johanna Elizabeth: That unimportant detail can be settled when the Russian ambassador gets here. Garishly Ornate, Complex Vision of Surreal Decadence! Two gnarled statues of grotesque beasts make love in the garden, a perverse cuckoo clock exposes female bodily organs, a skeletal figure shot through with arrows twists its face in a silent wail towards heaven. This is the decor of "The Scarlet Empress," furnishings which speak more of the film's themes and ideas than the plot could ever be allowed to. The actors remain intentionally wooden; it's as if the world around them was an expression of their suppressed emotions. Shame takes the guise of chairs, but chairs in the shape of gargantuan, deformed old men hiding their stricken faces in hideous fingers. Masochism is occasionally a clock, lust a decorative food display, but all perverse, leering. And death... Everywhere is a ghastly preoccupation with death, icons proudly display decapitation, skeletons stretch themselves over boiling cauldrons, while ghastly statues of tortured corpses lurk in every shadowy corner. Together this creates a world of painful decadence, a disgusting, yet fascinating dreamscape of visual pleasure. All this takes form and depth, is sculpted by director Sternberg's haunting lighting. It is "his" light, he lords over it, and with it anything is possible. He can make a face beautiful or ugly, innocent or evil. He can accentuate a certain side of a person's nature, or how a specific set piece relates to it, all with the proper illumination. If his lighting is astounding, equally so is Sternberg's use of the visual motifs in his mise en scene (bells, veils, figures, specific set pieces, etc...) to transport the viewer back and forth through the film. For instance, the binding of Catherine and Peter's hands at their marriage is later echoed by an unquestionably similar knot Catherine ties in a napkin she is fondling, and then tosses onto the table of she and Peter's last meal together. The initiation of their marriage and the initiation of its end are in this way linked, and the audience is forced to take into account the changes in both their characters. Not only does the rhythm of these motifs remain figurative. The movement of the film takes on a distinct rhythm as well. A swinging motif is evident throughout, the bells, the incense burners, Catherine's swing, the hoopskirts, a baby's basket, and so on. In this the film takes the feel of a frenzied, but excellently choreographed dance. But in all this there is one thing more noteworthy. Marlene Dietrich radiates! Quite possibly the most beautiful woman who ever lived, she begins innocent and virginal (seemingly intentionally melodramatically), standing out in a world of amorality. She is both the happiest and saddest point of the film. Her wedding to the vulgar Peter in an immense, yet claustrophobic cathedral is the most emotional part of the film. As it is filmed entirely in a series of close-ups of individuals, and long shots that blur their faces, there is no discernible eye connection between any of the characters. She is completely alone. As a voyeuristic camera cuts closer and closer to her trembling, veiled face, we suddenly feel the need to turn away. We know now that this last thread of decency is about to be crippled. Soon enough her innocence begins to fade before her sexuality, and the surroundings that once nearly suppressed her, she lords over, a queen of immorality. "The Scarlet Empress" expresses the essence of film, and why it succeeds as an art form. It creates the possibility of a world almost wholly artificial, divorced from anything that ever was. It retains only fragmentary reproductions of something that existed in a pre-filmed state, combining and distorting them to effect something 90% fake. What's more that seems all it is interested in. No other artistic medium (aside from painting) is viewed worthy of its visuals, and all theatrical, literary, or other requirements are given little attention. They are flippantly thrown in only to please a narrow minded audience, and occasionally (but very, very rarely) to accentuate the films themes. Yet painting, ah yes, painting. That was a medium worthy of a brilliant visionary like Sternberg, and one he transferred to the screen with gusto. 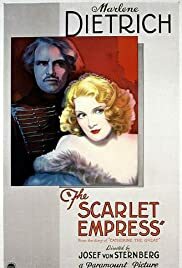 "The Scarlet Empress" is to Dali in its obsession with the bizarre, da Vinci in its detail, Picasso in its complexity of associations, but entirely Sternberg in its conception.